A New and Accurate map of the Southern Provinces of Hindoostan, showing The Territories ceded by Tippoo Saib, to the Different Powers. 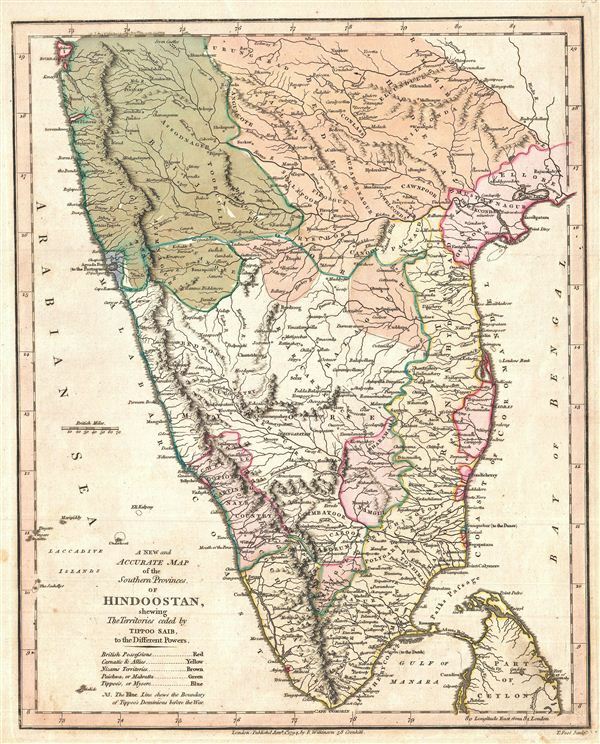 A finely detailed first edition 1794 map of southern India by Robert Wilkinson. Covers from Mumbai to Cape Comorin. This exquisite map is absolutely invaluable for those interested in colonial or Indian history, as it shows political boundaries of British, Karnatic, Nizam, Mahratta, and Tipu Sultan's possessions just after the defeat of Tipu, as well as the location of different peoples or castes. Tipu Sultan was one of India's great, forward thinking leaders, tolerant of Hindus, a supporter of engineering and science, and intolerant of the increasingly imperialistic British. Famously, Tipu kept a dream journal in which he records, among many startling images, a dream in which he was a tiger, attacking and eating a British soldier. This image became his emblem, and appears in scultpure and images of the time. Like his father, Tipu allied with the French to try to drive the British out, but was ultimately outgunned by england's superior weaponry. engraved by T. Foot for the 1794 first edition of Robert Wilkinson's General Atlas.